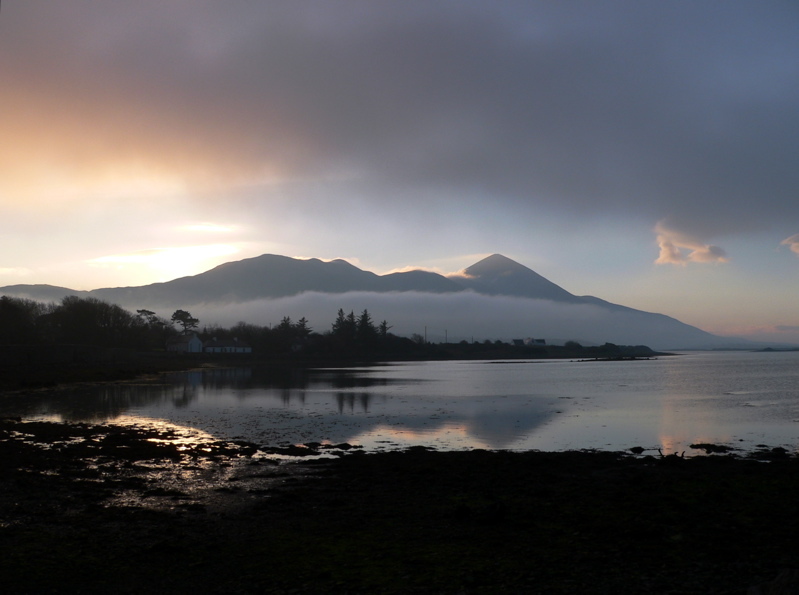 Croagh Patrick is a peak steeped in history, religion and mythology. At 764m high and offering breathtaking views across Clew Bay it’s also a rite of passage for hiking enthusiasts. 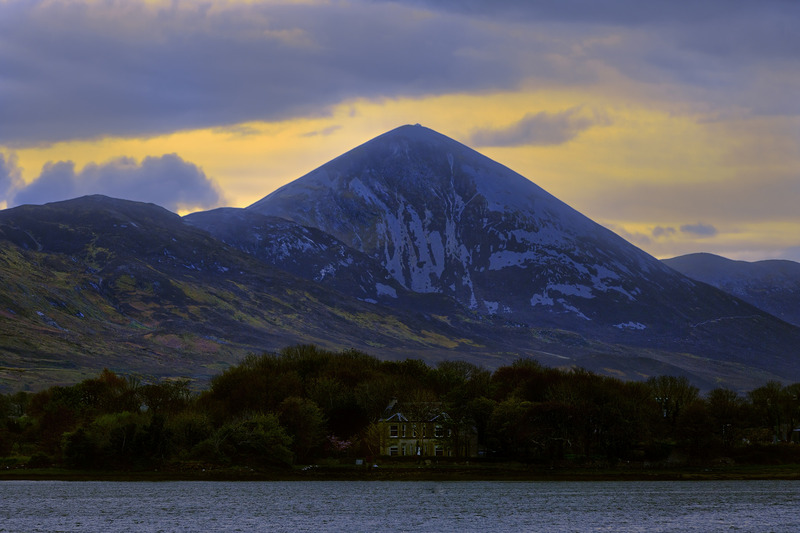 Croagh Patrick is one of Ireland’s most stunning mountain climbs with its unique conical shape towering above the edge of the Atlantic Ocean on the rugged west coast. 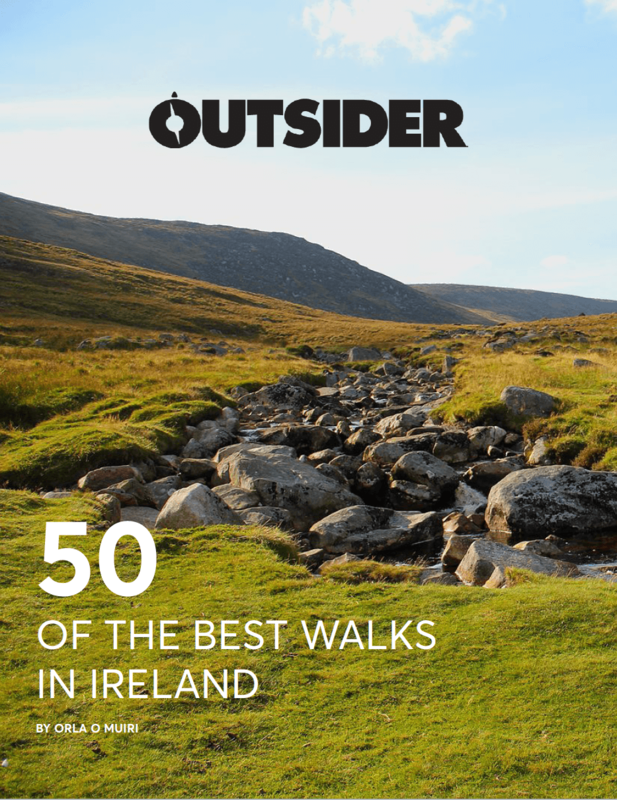 On a clear day, it offers panoramic views of the hundreds of tiny, green drumlin islands in Clew Bay, the Wild Atlantic Way, the gorgeous tourist town of Westport and surrounding mountain ranges. The mountain is steeped in history. It’s believed to have been a pagan pilgrimage route as far back as 3000BC, before Christian times. It’s thought that pagans gathered on Croagh Patrick to celebrate the start of the harvest season. But the mountain got its name and true fame from the story around St Patrick fasting at the top of the mountain for 40 days during the fifth century. Due to this Christian link, a small church was built around 1905 and mass is said there at certain times of the year. Because of that, it’s better known as Ireland’s ‘Holy Mountain’ or ‘The Reek’ among locals. Good for: People who don’t know how to navigate, but who want great views of the Atlantic coastline. Croagh Patrick: Where do I start the climb? The original pilgrimage and most common route to hike takes you from the small village of Murrisk, up the side of the mountain. At the base, there’s a car park (with a charge). Early risers sometimes park on the roadside to avoid the charge if there’s room. Another option for a quieter route is to approach the mountain along the ridge to the summit of Ben Goram, and along a col and another ridge to the base of the scree-covered upper slope of Croagh Patrick. Croagh Patrick: How difficult is it? Walking up Croagh Patrick is fairly difficult in places, as it’s steep, there are uneven rocks to get over and the upper slopes are slippery with loose scree. The tricky upper slopes require good fitness and flexibility (and a head for heights!). Good hiking boots make it a lot safer and more doable. 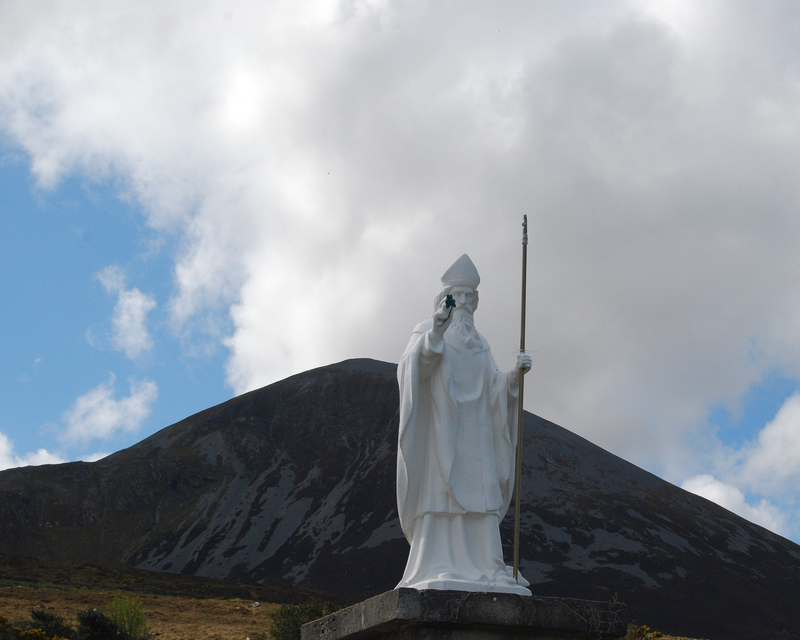 It’s a moderate to strenuous hike, starting in the car park at Murrisk and your first landmark after the visitor centre is to pass the statue of St Patrick that was erected in 1928. You’ll walk through a small gate and then the upward climb begins! There are three general sections as you ascend Croagh Patrick. The first section will take you from the car park to the shoulder or shelf of the mountain. It begins at a fairly gradual slope but gets steep in places and the surface is grassy and rocky in parts. You’ll be rewarded for every step with glorious views out over Clew Bay. The second section is not as hard as it takes you along the shoulder of the mountain to the base of the upper slope. This part of the walk provides brilliant views over Clew Bay and also to the south out over the Sheefry Mountains. The final section is the start of a huge pyramid-shaped mountain top covered in loose scree (stones and rocks), which makes for tough climbing. You’ll need to be extra cautious along this steep section, and sometimes walking in a side-to-side, or zig-zag shape can make it a little easier. You’ll definitely appreciate seeing the small church as you finally reach the summit. The top of the mountain is big enough to walk around and to sit and enjoy a sandwich or a cup of tea. But it’s the incredible panoramic views around south Mayo and north Galway that make this hike worthwhile. You’ll see the hundreds of drumlin islands that make up Clew Bay and Clare and Achill Islands in the distance. Look out for the Sheefry and Mweelrea Mountains to the south and the Nephin Beg mountain range in the north. If you’re looking for a quiet walk, or to have the summit to yourself, this may not be the mountain for you. It can be fairly packed at the weekends and in particular during Reek Sunday, which is the last Sunday in July. Around 25-30,000 people hike the mountain that day to follow in the footsteps of early pilgrims, with mass being said in the chapel at the summit. Some people even do it in their bare feet, as was traditional back in the day! There is also some criticism of erosion along the route because of the number of walkers who make the journey. It’s estimated that up to one million people climb the mountain every year. The best time to climb the mountain is generally during the spring/summer/autumn months between April and September when it’s warmer, brighter and a little more settled weather-wise. But there’ll still be plenty of wild days. As is typical along the West Coast of Ireland, the weather can be very changeable, so expect all conditions even if you set out on a clear, fine day. Be sure to check the weather forecast before you set off and always carry extra layers and rain gear. The summit of Croagh Patrick can disappear in low cloud at times, which may affect your view. There are alternatives in the area if the weather is too severe up the mountain, like the lovely Greenway or even a beach walk if that takes your fancy. Solid hiking boots are advisable, particularly for the rocky/uneven parts of the climb. As mentioned, rainwear is essential along with extra thin layers in case it’s cooler at the top. It’s also wise to bring food and drinking water, to make sure your phone is fully charged, a compass can be handy if visibility reduces and sunscreen and a hat are great if it’s sunny. Croagh Patrick: How do I get there? The start of the mountain walk is a short 10/15 minute drive from Westport town and most people come that way by car. There are also bus and train services to Westport from Dublin and Galway if that’s your preference.